I've written about NSMnow a few times before and I'm a big fan. They already had at least partial support for Fedora and I suggested to the developers some changes that would allow them to also support RHEL/CentOS. The SecurixLive team has done an amazing job with NSMnow (and Barnyard2) and things just keep getting better! SANS 401 Mentor class coming to Augusta! I'll be mentoring SANS 401 Security Essentials in Augusta, GA on Tuesday nights starting January 12, 2010. ISSA members are eligible for a 25% discount! Why should you take SANS 401 Security Essentials? * Are you a Systems Administrator or Network Engineer who would like to learn more about security? This course gives a very thorough overview of security theory and practice. Additionally, the tools and techniques that you learn in this class are directly applicable to your current job (and will prepare you for the future). * DoD 8570 Compliance. If you work for the Department of Defense (or would like to), DoD Mandate 8570 requires security certification for any employee performing Information Assurance (security) work. The Security Essentials certification is among those required for 8570. For more information, please see the SANS 8570 page. * Complement your CISSP. If you've already taken the CISSP, SANS 401 Security Essentials is the perfect technical complement. It takes all the theory that you learned at a high level for the CISSP and applies it in a very practical and updated manner. SANS 401 is "where the rubber meets the road". * Augment your Windows/Linux skills. Highly experienced with Windows, but not so much with Linux? Or the other way around? SANS 401 Security Essentials dedicates an entire section to Windows security and another entire section to Linux security. * Considering the SANS GSE (GIAC Security Expert) or SANS Masters program? SANS 401 Security Essentials is required for both. Don't forget that ISSA members are eligible for a 25% discount! If you would like to register for the ISSA and/or SANS 401, please let me know and I'll be glad to help get you registered. * All Xubuntu 9.04 updates as of 2009/07/31. * Added sqlite and libsqlite3-ruby packages for db_autopwn. * Latest Metasploit msf v3.3-dev as of 2009/07/31. * Latest Nmap 5.05BETA1 as of 2009/07/31. UPDATE: This issue has been fixed in the Security Onion LiveCD 20090731 release. I was testing the new Security Onion LiveCD yesterday and trying to use Metasploit's db_autopwn function. The first step of db_autopwn is to create a database to hold the information about your potential targets. This is done with the db_create command. When I issued this command, I got an error about sqlite3 (the default database driver for db_autopwn). This will be fixed in the next release of the Security Onion LiveCD. Need to get 247kB of archives. After unpacking 811kB will be used. Selecting previously deselected package libsqlite3-ruby1.8. Selecting previously deselected package libsqlite3-ruby. * All Xubuntu 9.04 updates as of 2009/07/24. * Added a Security Onion section to the Applications menu. * Latest Metasploit msf v3.3-dev as of 2009/07/24. * Latest Nmap as of 2009/07/24. "Investigators may not yet know who was behind a series of cyberattacks on the U.S. and South Korea, but analysts are getting a better grasp on where the nations' governments may have gone wrong. Numerous government Web sites in both countries have been hit by distributed denial-of-service attacks, starting on the Fourth of July and continuing into today. Dozens of high-profile sites have been targeted, including those of the Federal Trade Commission, the Department of Treasury, and other major federal agencies." "'Too many federal agency security people did not know which network service provider connected their Web sites to the Internet,' explains Alan Paller, director of research at the SANS Institute, a security research organization." Alan's statement is quite scary, but I'm sure quite true. When the killer clowns come knocking at your firewall's door, you need to be able to pull the plug in a hurry. Perhaps we should have Internet fire drills where we propose a mock DDoS attack and have our technicians play out the scenario. Who ya gonna call? This will be the first time we are offering Security 501 and a rare opportunity to take this course from Dr. Eric Cole in a small class setting. We are also offering 3 short courses which offer a great opportunity to get SANS content in only 1 or 2 days." I'm currently working on the next version of the Security Onion LiveCD. What specific packages/features would you like to see added to the Security Onion LiveCD? Post a comment here or contact me on Twitter. Thanks! -All Xubuntu 9.04 updates as of 2009/06/13. The Security Onion LiveCD is now available! The Security Onion LiveCD is a bootable CD that contains software used for installing, configuring, and testing Intrusion Detection Systems. What software does it contain? The Security Onion LiveCD is based on Xubuntu 9.04 and contains Snort 2.8.4.1, Snort 3.0.0b3 (Beta), sguil, idswakeup, nmap, metasploit, scapy, hping, fragroute, fragrouter, netcat, paketto, tcpreplay, and many other security tools. The Security Onion LiveCD can be used for Intrusion Detection. Simply boot the CD and double-click either the Snort-Sguil or SnortSP-Sguil desktop shortcuts. The Snort and Sguil daemons will then start, listening on eth0 for any suspicious traffic and creating alerts in the Sguil console. The Security Onion LiveCD can be used to test an Intrusion Detection System. Simply boot the CD and use the included tools (such as nmap, metasploit, idswakeup, scapy, hping, and others) to test your existing IDS or to test the included Snort 2.8.4.1 and Snort 3.0 Beta 3. The Security Onion LiveCD can be used to install an Intrusion Detection System. Simply boot the CD and double-click the Install desktop shortcut. For more information about installation, please see the README desktop shortcut. You can read more about the Security Onion LiveCD (and, specifically, the integration of Snort 3.0 and Sguil) in my SANS GCIA Gold Paper "Snort 3.0 Beta 3 for Analysts". Please take a look at the Security Onion LiveCD and let me know what you think! Marty Roesch and the whole SourceFire team for all of their work these last 10 years to get Snort to where it is today. The Sguil team for the best open-source tool to manage Snort alerts. The SecurixLive crew for their awesome NSMnow installer, the easiest way to install and configure Snort/Sguil on Ubuntu Linux. Ubuntu (and Debian) for their well-made Linux distribution(s). The Reconstructor team for a very easy to use tool for remastering Ubuntu LiveCDs. All developers in the open-source community who work so hard and produce such amazing tools. My previous Sguil/NSMnow recipes used Ubuntu 8.04. I thought I'd play with the new Ubuntu 9.04 and see if there were any differences. It looks like there is a new AppArmor profile for tcpdump that we'll have to configure if we want to pull session transcripts using Sguil. (This is in addition to the AppArmor profile for MySQL that we were already having to configure to allow it to read the load directory.) These steps have been formatted so that you can copy/paste them into your terminal. Disclaimer: I offer no warranties of any kind. If your box breaks, you get to keep both pieces! Snort is now capturing packets on eth0 and analyzing them. Let's verify that now. This demonstrates that Snort is analyzing packets and outputting in unified2 format, which is then read by Barnyard2 and inserted into the Sguil database. At work, one of our remote business units was experiencing slowness in their WAN link. Our Network Architect began looking into the problem and found that one particular device on their network was sending enormous amounts of traffic over the link. Looking into it further, he discovered that the device was one of our security cameras in the business unit's server room. He then came to see us and asked about the camera. This particular camera is motion-activated and therefore shouldn't have been capturing all the time, but it was. We looked at some of the videos and, at first, didn't see anything out of the ordinary. After racking our brains for a few minutes, we finally noticed that there was a piece of paper taped to the front of one of the server racks. The paper was taped in the middle, allowing the sides to flap in the wind of the air conditioner. This created just enough motion to trigger the camera to record and transmit its video. "We've discovered the problem with your WAN link. Please go to your server room and remove the piece of paper taped to the front of the server rack. Your WAN link should then magically speed up. Thank you." My modest proposal is that paper is obviously increasing our bandwidth costs and we should therefore go completely paperless. My SANS GCIA Gold Paper on Snort 3.0 Beta 3 has been posted to the SANS Reading Room! With the new DCE/RPC preprocessor, there will be a number of updates to the rules. Please be sure to update your rules to the latest when that package is available (next few days). To complete the updating of my 3-part series on Installing and Configuring Snort 3 Beta 3, I now present to you the final chapter in this trilogy: the updated recipe for Snort 3 Inline Bridging Mode in 3 Steps. Snort 3.0 Beta 3 has changed the syntax for creating a new dsrc, so this has been reflected in the new recipe. Since I updated the "Installing Snort 3.0 Beta on Ubuntu 8.04" post to work with Snort 3.0 Beta 3, here's the update for the "Integrating Snort 3.0 (SnortSP) and Sguil in 3 Steps" post. Since the original post, NSMnow 1.3.5 has been released, so the URL has been updated in the recipe to reflect this new version. Also, there appears to be a bug in the current sspiffy.sh whereby it configures the dsrc type to be "file" instead of "pcap". I added a quick one-liner to correct this in the snort.lua file. Please note that if you have an existing NSMnow installation, following this recipe may or may not work. This recipe is designed for new NSMnow installations. The best open source tool to manage Snort alerts is Sguil and the easiest way to install Sguil is using NSMnow. NSMnow automatically installs and configures barnyard2 (compatible with SnortSP's unfied2 format), sancp, Sguil, and Snort 2.x. We're going to replace NSMnow's snort alert process with Snort 3.0. This quick recipe assumes that you're running on Ubuntu 8.04 and your primary network interface is eth0. You should be able to copy/paste each of the three code blocks into your terminal. Obligatory disclaimer: I offer no warranty of any kind. If this breaks your box, you get to keep both pieces. Snort 3.0 is now capturing packets on eth0 and analyzing them. Let's verify that now. This demonstrates that SnortSP is capturing packets, analyzing them with the Snort 2.8.2 Detection Engine, and outputting in unified2 format, which is then read by Barnyard2 and inserted into the Sguil database. When finished, return to your SnortSP window and press ctrl-c to terminate the SnortSP process. Then type "nsm --all --stop" to terminate all NSMnow processes. Snort 3.0 Beta 3 was released on April 1. You can read an overview of the changes in Snort 3.0 Beta 3 in the mailing list announcement. For more details on the underlying architectural changes in Beta 3, see Marty Roesch's blog. Thanks to Marty and the rest of the Snort 3 Development Team for their hard work in this release! So once you have Snort 3.0 installed, what can you do with it? One thing you can do with it (and the one that most people are interested in) is to configure it for IDS mode. The Snort 3.0 architecture includes the Snort 2.8.2 Detection Engine, so we'll have the Snort Security Platform (SnortSP) capturing packets and handing them off to Snort 2.8.2 for analysis and alerting. Here's a really quick recipe for installing the Snort 3.0 Architecture on Ubuntu 8.04. 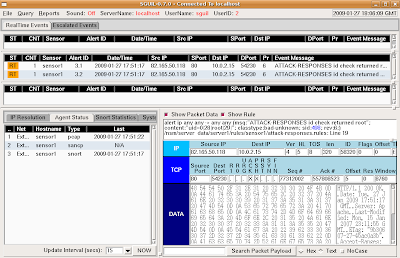 Note that the Snort 3.0 Architecture consists of the SnortSP framework and the Snort 2.8.2 Detection Engine. You should be able to open a terminal and then copy/paste each of the three blocks of commands. Future posts will cover where to go from here. I previously discussed the NSMnow project. These guys have made tremendous progress in the last few weeks and have fixed the bugs that I notified them of. They are now at version 1.3. Go check it out! Registration is now closed for the previously mentioned SANS 503 Mentor class here in Augusta. This was the first SANS Mentor class to sell out in a few years! Thanks to all who registered. Have you ever been in a situation where you needed to calculate multiple hashes (md5 and sha1, for example) of a large drive image, but you didn't want to wait the long time it would take to do the following? We have less than 2 weeks to go before the January 20 deadline for the best deal on SANS 503 Intrusion Detection training here in Augusta! If you're not an ISSA member already, you can join today (only $120.00) and take advantage of the 40% discount for ISSA members. ISSA Members who wish to register for the class should contact me or one of the other chapter leaders for the Discount Registration code. A few months ago, I upgraded from Fedora 8 to Fedora 9 using Preupgrade. Last night, I decided it was time to upgrade to Fedora 10 (F10), so I went the Preupgrade route again. Haven't seen any other problems so far.